My tomato plants are beautiful with exception of no blooms. If I do not water everyday in this 100 plus heat, they droop! Why are they not blooming? 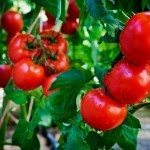 Will I not have tomatoes this year? 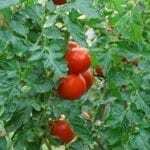 High temperatures are most likely the reason the tomatoes are not setting flowers. You can try increasing Phosphorous by adding some Bone Meal. Epsom Salt can be a help also.